Training out of Impact MMA in Singapore, Niko Soe, 26, was one of the winners at “ONE: Roots of Honor.” It was his second victory in ONE Championship. Featuring two kickboxing contests, two Muay Thai bouts and 11 mixed martial arts matches, “ONE: Roots of Honor” took place at the SM Mall of Asia Arena in Pasay City, Metro Manila, Philippines on April 12, 2019. In the fourth bout of the evening, Soe faced Eko Roni Saputra, 27, of Samarinda, East Kalimantan, Indonesia in an MMA match in the flyweight division with Yoshinori Umeki as the referee. Umeki put a stop to the flyweight contest after 3 minutes and 3 seconds in the first round. He raised the hand of Soe, who was declared the winner via technical knockout via doctor stoppage. Winning at “ONE: Roots of Honor” improved Soe’s professional MMA record to 3 wins and 1 loss. On the other hand, Saputra now has 0 win and 1 loss. It was a successful comeback for Soe, who went on hiatus from 2017 to 2018. He holds a diploma in Hospitality Management but he works as a a Muay Thai and MMA trainer at Impact MMA. As an MMA fighter, Soe has been competing professionally since 2013. 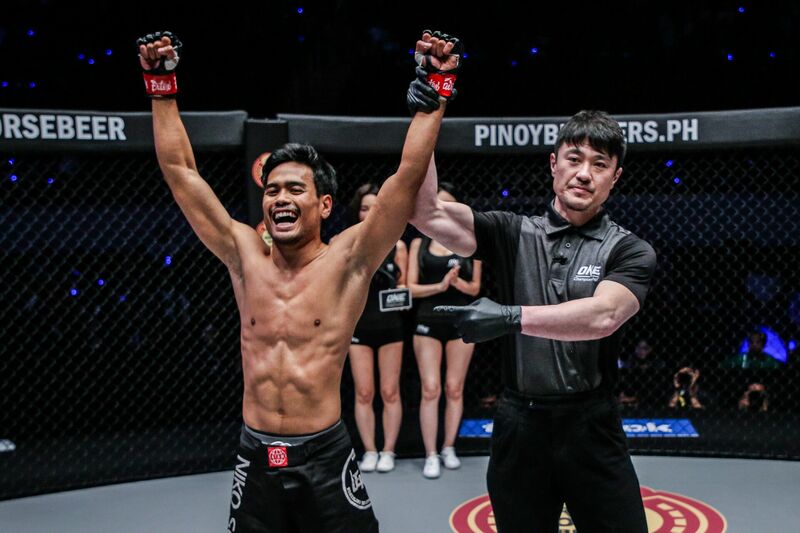 He made his ONE Championship debut at “ONE: Defending Honor” on November 11, 2016. Featuring nine MMA matches, “ONE: Defending Honor” took place at the Singapore Indoor Stadium in Kallang, Singapore. In the first bout of the evening, Soe submitted Muhammad “The Rising” Haidar, 24, of Telok Panglima Garang, Selangor, Malaysia via armbar after 1 minute and 17 seconds in the first round. Including Singapore and Indonesia, 18 countries were represented at “ONE: Roots of Honor.” The other countries were fghanistan, Australia, Brazil, China, Cuba, Japan, Mongolia, Morocco, the Netherlands, the Philippines, Romania, Serbia, South Korea, Thailand, Vietnam and the United States. Soe solely represented Singapore at “ONE: Roots of Honor.” On the other hand, Saputra was one of the two fighters who represented Indonesia. Check more photos from Soe and Saputra’s bout at “ONE: Roots of Honor” are on Top Sports Asia.